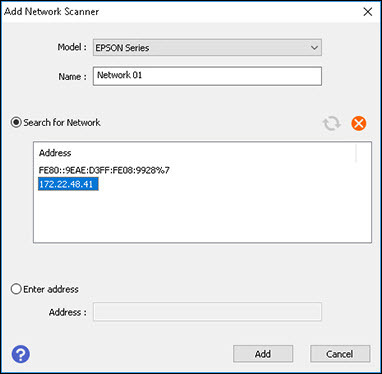 I see the message Unable to connect to network scanner. Check the scanner, network, and connection settings. What should I do? Make sure your product is connected to the same network as your computer. Click Yes on the error message screen. The Scanner Settings window appears. Click Enable Editing or and click Yes on the screen that appears. If necessary, enter the administrator password and click OK. Note: If you do not see the Enable Editing button, run the Epson Scan 2 Utility as the administrator. Navigate to the shortcut for the Epson Scan 2 Utility, right-click the shortcut, and then click Run as administrator. Select your product from the list in the Scanner Settings window and click Delete. Click Add or +. Make sure your product is selected as the Model in the screen that appears. Select the IP address for your product. Note: If you don't know your product's IP address, you can print a network status sheet from your product to obtain it. Note: If nothing appears in the Search for Network box, make sure your product is connected to the same network as your computer. 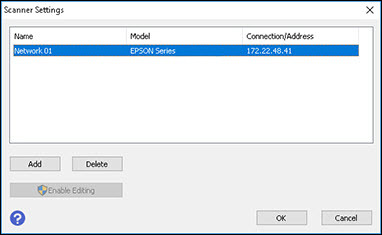 If your product is connected to the same network and the box is still blank, contact Epson Support. Click Add. Your product appears in the Scanner Settings window.